Family members of Steve Ifshin, UVM Class of 1958, and senior administrators from the University of Vermont and the Grossman School of Business Board of Advisors participated in a groundbreaking ceremony today for Ifshin Hall. The new building will provide critical capacity and much-needed resources for the business school while increasing students’ opportunities for success. 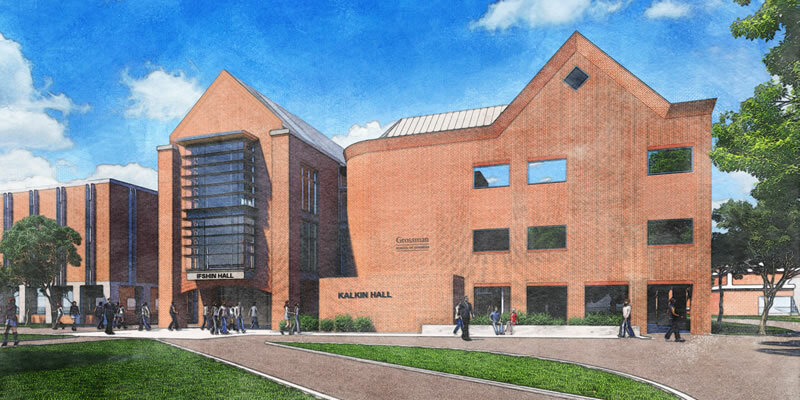 Ifshin Hall is named for Steve Ifshin, a former member of the Grossman School of Business Board of Advisors and the UVM Foundation Board of Directors who died late last year. The UVM Foundation announced Steve Ifshin’s gift of $1.75 million for the project in September 2016. A lifelong resident of New York City, Steve Ifshin attended UVM on a basketball scholarship and enjoyed a highly successful half-century career in the real estate industry. He was fiercely dedicated to the Grossman School of Business, serving for 10 years on the Board of Advisors before stepping down as co-chair last fall. The company he co-founded with his son Adam, DLC Management Corporation – one of the nation’s preeminent shopping center developers – received the Grossman School of Business Family Business Award in 2012. Steve Ifshin also was a major supporter of the Miller Center for Holocaust Studies at UVM. His generosity, wise counsel, unwavering commitment and infectious enthusiasm were recognized by his colleagues on the UVM Foundation Board of Directors with the dedication in April of a tree and plaque in his honor at UVM Alumni House. Steve Ifshin is survived by his loving family, his wife Billie, his children Noelle and Adam, his sister Ellen, his three grandchildren and numerous other family and friends.